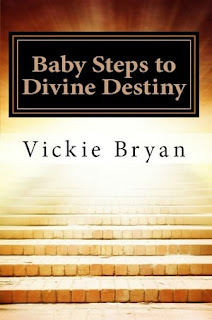 Today we are interviewing Vickie Bryan, author of "Baby Steps to Divine Destiny." I am an author who never dreamed of writing. Then one day I knew a book had been placed in my heart by the Holy Spirit. The only way to find out if I could even pen it was to sit down do it. After the first one, years went by and I did not know if I would write again. Well, that changed when the Lord placed another book in my heart, and so it goes. 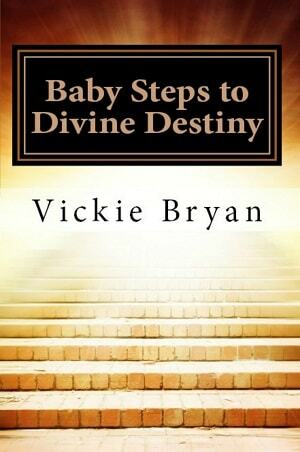 "Baby Steps to Divine Destiny" is designed to motivate the reader towards fulfillment of their own God given destiny. How? One simple baby step at a time. Anyone frustrated, along with those who lack purpose or progress in their lives. My desire for the reader is to finish this book inspired. What inspired you to write a book that helps people fulfill their divine destiny? People struggle with the question, “Why am I here?” In my own life, without a relationship with the Lord I am convinced I would have never written that first book. Others need to be encouraged to discover God’s purpose for them. Can you elaborate on what is a person’s divine destiny? Since we are talking about divine destiny, a scripture will help. "Before I formed you in the womb I knew you, before you were born I set you apart; (Jeremiah 1:5 NIV)” Even before conception, God knew his purpose for the individual. As this scripture continued, it is the Lord who made his purpose known. The only way to understand divine destiny comes from a relationship with the Lord. Your book encourages people to take baby steps in accomplishing their goal. Why is this important? A baby step sounds simple and it is, but for some people a goal seems to lofty, so they do nothing. With one baby step at a time, momentum can be achieved. It will build faith and motivation for people to get going and allow God to use them mightily. I have two book series I am working on: Nephilim Imprint and Christian Imprint Books. Nephilm Imprint Books brings Biblical understanding of wicked people whose heritage goes back to Genesis 6:4. Christian Imprint Books are back to the basic books. These are written for the believer in Jesus Christ to stay with sound doctrine and avoid masters of deception about us. "Baby Steps to Divine Destiny" is also a great tool to encourage a walk with the Lord as well as achieving divine destiny.